Big guys were down and the Pig was back in the sty. And we have a Loophole VC option that went big! Who knows what else round 2 has in store for us! Let’s Scramble!! What an amazing weekend of footy, if you got more than 5 or 6 in your tips you are a genius, I had a shocker. But one thing that we did have is some great fantasy scores and we simply can’t look any further than the Pig himself! We have a bit different strategy this week in the three different forms of the game but I will mention differences where needed as we go. Another Thursday Night but more of a Loophole Chance this week. Unlike last week we had more options for our VC last night and we also have one week of form in the books to assist us. Looking at our options from last night here is how they went. Treloar – 152 BANG! Take this all the way to the bank! I certainly will be. Grundy – 112 A great comeback from the big fella this week after many wanted to trade him out, but I wouldn’t be taking this, not quite enough. Dusty – 59 Yuck. Not Dusty’s night. Pendles – 108. A good contribution but no, not for the captain. As always the line is about 120 before you need to make a decision. We saw a few other Pies go big with Crisp 142 and Mayne 131 being the only ones that you would take as a VC option but let’s be honest I don’t think anyone is going to have gone them as VC. If you did then you are a genius! For those that are taking any of the scores above as VC remember to put a non-playing player onto the field and have them as C with the E on the guy you take off. I am doing this with Darcy Cameron from the Swans as we will know whether or not he is a late in before lockout but he is pretty safe since he isn’t on the emergency list. Neither is Darcy Fort so he is another good option. Did anyone loop Darcy Moore on the bench? If you did this in the backline you may want to keep Marty Hore in your side if you had him to be that loop player for you. We saw on Wednesday night that Balta wasn’t named and missed the game last night. Now we know that Marty Hore, Jordan Ridley, Darragh Joyce and Jarrod Brander haven’t been named and Tarryn Thomas is on the extended bench. This is where in AF we use those two trades we have and move these guys out (hoping you did that with Balta before last night’s game of course) and bring in the guys from Fry’s list on Wednesday. If I had to pick any of those guys to keep in my team on the bench I think it is Ridley. NOTE: Extended Benches are now 8 players and not 7 as it used to be! Interestingly our poorest performing rookies from a Fantasy perspective in Burgess and Collins have been named on field in key positions at opposite ends of the field! Remember you don’t have to trade out the rookies that aren’t named if you have other changes you want to make. It is a valid strategy to keep them. Reason being that they won’t change in price if they don’t play. So you can keep one of them and make trades for other players that didn’t perform and have a high BE now or make the moves you need to do to bring in someone like Rocky. Don’t overthink things of course. At this stage of the game rookie cash generation is the key, but just remember that you do have other options if you have other plans to execute or holes to fill in your lineup. There is a massive distinction between AFL Fantasy and Real Dreamteam/Supercoach. AFL Fantasy is the only one that has prices change in the first week and it is also one that doesn’t have limited trades. In both Real Dreamteam and Supercoach the common practice at this stage is to hold your trades and not use them and wait for another week before prices change. That is what I will be doing in those two forms of the game because anything can happen. But in AFL Fantasy you have the “use them or lose them” two trades per week. So based on that we have decisions to make. I have made a few comments about rookies above and here are some of the questions that you asked me during the week on this topic. Cheers for the question Hendrick. This is a bit of a tricky one at this stage. For me the first thing you need to do is sort out your rookies that are going to make you cash. After that you can start doing other trades. Only then can you consider doing sideways trading for premiums. Once again, this is an AF move only, in the limited trades we don’t sideswap premiums until round 23. I don’t mind the move of Dunkley to Kelly. But if you can do other things this is one that I wouldn’t mind waiting on for another week for just to check that Kelly is the real deal and to see if Dunkley’s role doesn’t change. Would you consider grabbing Tim Kelly for Dunkley or wait and see what Dunkley provides this week? Hi Cooper, as I said above there I don’t mind the move but I would wait and see what Dunkley can do this week. With the other three I would probably rank as Rocky first then Taranto then Sheed. I am quite worried about Sheed’s role when Gaff comes back. I know Gaff was there during the JLT and Sheed scored well but that is JLT which isn’t the same as the real stuff. Whilst I am a little concerned about Rocky I am going with him over Taranto mainly due to Rocky’s back catalog of work. Leave Collins and Burgess on Def bench and upgrade Scrimshaw to Newman? Or Sideways the Gold Coast rookies to Wilkie and Hore? Thanks for the question Michael. Certainly not a bad idea to go Scrimshaw and Newman if you are concerned about the scoring power or job security of Wilkie and Hore (we now know that Hore’s JS isn’t all that great since he has been dropped this week!). If that is the only option you have in terms of rookie movements I can understand wanting to see another week out of Wilkie and Hore won’t change in value this week now so no real harm in holding him another week if you want to do something else. Having said all of that, you need to make sure you are comfortable that Newman can keep that sort of form up. He had a good JLT1 but wasn’t as good in JLT2. S0 whilst I am ok with leaving the GC guys on the bench and doing something else I am not sure that Scrimshaw to Newman is the move I want to make as Scrimshaw has a BE of just 15 so has some money to make. As I did last year I will give you a few of my Fantasy Relevant thoughts on what has happened at selection and things to look out for. Seedsman is back off his finger injury so don’t expect too much from him as he may be a little underdone. Toby Greene is out injured, word was that he is out with General Soreness, but that can’t be right, it is March still!! No sign of Josh Kelly either, this is killing a number of draft teams that took him in the first round (mine included!). Melbourne swung the axe with Spargo Hore and Wagner all out. But in a relief for some draft teams May and KK are back. Plus we have a new rookie in Jay Lockhart. James Cousins sees himself third last on the bench and in danger of being omitted as the cull happens tonight. But I have a feeling he won’t be missing out based on some of the other names on that list. But make sure you check final teams this afternoon just to be safe. The Suns bring in another rookie and that is Ben King. He is a key position type and I would take a wait and see approach. Draft teams will be happy to see Jesse Hogan back in the Fremantle line up this week. Don’t panic, it has only been one week. With respect to the above comment, look at what Grundy did this week, he bounced back and showed us that he still has it and to keep the faith with guys that had a bad first week but have long term form. Rookies that aren’t playing don’t necessarily have to be traded out if you have other issues you want to fix. They won’t lose value. AF is the only form that trades should be done. After a big weekend of footy with some great scores hopefully we will see something similar this week. It is a long season and if your premo’s didn’t perform this week don’t stress. Remember you picked them for a reason and you did 2-3 months of research on them and you may not want to throw all of that out after one game of footy. Great to see heaps of comments last Friday with people helping each other out. I will try and jump in and answer some questions and give some help, but as most of you long time readers know it is difficult for me to do sometimes due to work, so don’t think I don’t want to help or don’t appreciate your comments, it is just that work commitments don’t always allow me to respond in a timely manner. All the best this week, enjoy the footy and I’ll see you all again next Friday morning. Me too – what an absolutely piggish performance! Best thing is that he loves to run and create the cheap +6. So many times I could see him run into space and be that link up player… plus he’s got great hands. Looking forward to more of this rather than his round 1 performance. I actually had the VC on Crisp last night. Purely because he was my only Pies/Tigers player so i kinda got lucky. Put the C on Jordan Sweet this week. Nice Andy!! 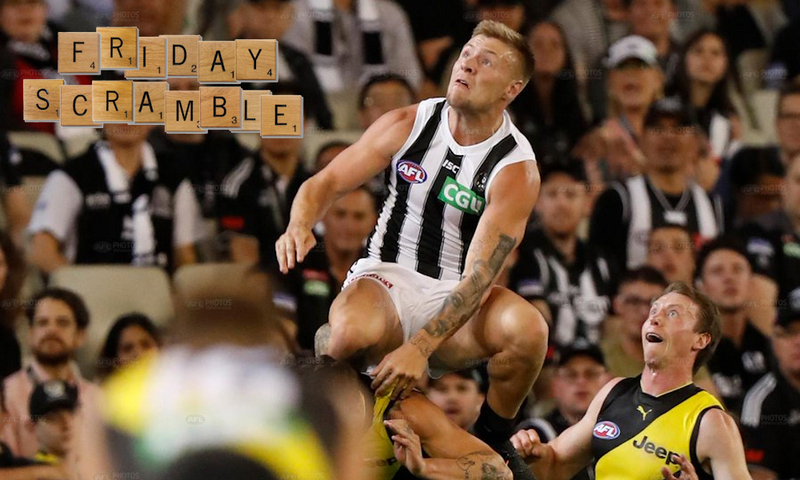 I got Treloar who seemingly jumped from 148 to 152 after the game had finished..
What’s your thoughts on the pecking order of (1) job security and (2) who may fall first?? Cheers mate. I jumped in that league. In terms of who may fall first out of that quartet it is a tough one. To be honest they are all very even in my view. I think Rozee may be first to fall? But Drew could be in danger when Wines returns. I think we may have a better picture after this week when we have a bit more data. Fix up the rookie, or chase the big dog before he rises again? I have a feeling Merrett will be back in business this week against the Saints.. but it’s hard to argue with Rocky’s scoring potential this week and plus look at both of their BEs. Hore to Wilkie can potentially wait a week too… we don’t know what Wilkie will dish up and Hore might get back into the side next week as well. 1. Neale to Rocky and fix a rook. I’m doing 2 mate, but don’t have Neale. If I did I’d still do 2. Note: Need to Field 1 of the above, due to lack of confidence in Collins and Burgess. I’m in same boat as you have downgraded Brayshaw to Rocky to save cash. Do I get Burton, Tucker or Libba as a one week cameo before goinf to rocky if I can next week? If burton then I would have the option of trading the worst perfermer of Williams/Smith/Burton/Witho but if Tucker or Libba then they would be the only players I can trade to Rocky next week. Also do I take Grundys 112 if my only captain options are Cogs, Brayshaw, and Danger? Don’t go Powell. Horrid scoring history… has one-week-wonder written all over it. That said, happy to be proven wrong, you’d just need to see another week from him first. Libba had a good run last week and should continue to build I think, although Tucker could be a good POD as well. Considering that I am using Hore for Treloar VC, It looks like that I may NO CHANGES to my squad this week. $0 in bank – clean sheet. Gawn to Witts? Williams to Newman or Mills to SicDawg? …hmm. just realised that Hore is an emergency, so Fort will have to have the C as a definite. I like Gawn to Witts. If you look at Witts’ scoring over the past few years he’s been building up closer to that 100 avg. The Cats will target him again like Port did last week, and Stanley is also known for restricting the opposition ruckman. That said, Gawn will have a shitload of motivation to prove everyone wrong this week so could come out all guns blazing. I’d expect his teammates to be very physical in protecting him too. Of the others, I like Williams to Newman because I’m not sold on Williams yet. He should have racked it up against the Bombers last week and couldn’t even manage 70. Hey Dunny, great read agian. What are the better trades? Hore to Schultz via Burgess? Currently done 1. Held Balta this week, in the hope he comes back in. He may now with Riewoldt down. Hi, I think Hore to Schultz via Burgess, only because I am not sold on Lockhart and his JS and I don’t want to trade out Dunkley or Williams. My decision to part with Elliot to be able to bring in Rocky (Worpel to the fwds) seems to have been a good one. 48. I’m glad I missed that score! 2. Brawshaw to Rocky and then Hore to Lockhart/Clark. Who should i trade out for the RockPig? Cripper or Gus Brayshaw? Anyone having issues trading? I’m trying to trade out Collins and move Burgess to DEF to get in Schultz but both the app and website won’t let me swap. Have heard others having trouble with DPP trades using the app. Try to go to the AFL website using your phone or computer preferably. Sorry just saw you said website as well. If you can’t access a computer maybe try using a different browser? Like Chrome instead of Safari for example. Good luck! What is everyones thoughts on Zerrett? I didn’t see his game last week so only know that he spudded hard – injury or tag or forgot how to football? Zerrett had an injury interrupted pre-season so I think he is just taking a while to build his match fitness. Played managed minutes in the JLT and didn’t look at his best against GWS either. I think it’s worth trading him and looking to get him back in post-bye if he comes good. Last year his post-bye average was up around 110+ from memory, but he’ll be cheaper by then and you can use Sloane or Taranto as great players in the meantime. Personally I’d go Sloane because he looks like he’s in ripping form and Taranto won’t get as much space each week as he did against the Bombers last week. Sloane is taggable, but with Matt and Brad out there to help him, he seems likely to score well anyway. Need to choose 2 out of these 3 and im stuck! Any advice is appreciated, im looking for guys that can sit there all season..
Worpel is a lock but i’d flip a coin on both Boak and sheed. Any ideas on what I should do next, should I chase rocky or fix up my other rookies? I was in a similar position to you but with the benefit of already having Rocky. Obviously chasing PODs with Hopper, Jones and Lynch, with the latter the only one that I will look to trade next week. My trade for this week is Brayshaw -> Scott and Hore -> Newman. I think a similar trade could work for you as getting Scott would give you unnecessary Midfield depth, where as your 5 defensive rooks with unreliable output and falling job security could use a patch up ASAP. 1.Mundy to Kelly and a rookie to a rookie. But miss out on bailey scott. I think I go first one. Walsh will rise a lot in value and isn’t worth moving on just for Scott who will do the same. Who to dump out of Gibbons and Atkins ? Who to bench out of Constable and Walsh ? Leaning towards Gibbons and Constable…. Heeney to Worpel ($340k in bank) or Libba to Worpel (DPP) (70k in bank) ?? I agree I don’t like touching them. But if you go Heeney to Worpel. I can see them both scoring very similar but Worpel will go up cash and Heeney is one game away from going down a heap. True that but do remember Heeney is a top 5 Forward price player aca premium pick. The difference heeney to worpel is 150k. If anything trade another player for worpel Harry???? Don’t give up on premium players after round 1, perfect example Grundy last night!! Taking Trelaors VC to the bank and cashing that yeeeeeow!! Thinking of going risky this week to get Rocky in. Billings + Atkins to Rocky + Parker (saints), have to field Parker at F5 but is he scores 50-60 ill be happy with that. Actually had the V on Crisp until teams were announced. Had to reverse trades as my R2 had been dropped. Forgot to put it back on until after the game had started. Rocky better do well as my C.
Hearing murmurs that CEY traveled with the Crows and there a big mid was possibly out, some suggesting it might be Brouch. Can anyone shed any light on this? No.1 means I have Drew, Constable on field, and scrim gets kicked off. No.2 would mean I’ve only got Walsh as a rookie on field. Or B. Smith to Newman? Give Dunkley another chance buddy, I am! Alastair Clarkson plays the youngsters he’ll drop someone else! I had Cunningham in DEF but he is now injured and also Vardy (has to go) in FWD.